Landlords are always asking questions regarding the collection of their attorney fees after successfully evicting a recalcitrant tenant. The answer to that question always depends on whether the Rental Agreement has a provision for attorney fees. California follows what is commonly referred to as the American rule, which provides that each party to a lawsuit must ordinarily pay his own lawyer. The California Legislature codified the American rule in 1872 when it enacted Code of Civil Procedure section 1021, which states in pertinent part that “Except as attorney’s fees are specifically provided for by statute, the measure and mode of compensation of attorneys fees is left to the agreement, express or implied, of the parties. Since that time several statutory exceptions have been made to the American rule, and we have relied upon “inherent equitable authority” – which means courts have inherent supervisory or administrative powers which enable them to carry out their duties, and which exist apart from any statutory authority – to develop three additional exceptions; 1) The common fund, 2) Substantial benefit, and 3) Private attorney general theories of recovery. California Civil Code Section 1717, subdivision (a), provides in pertinent part that “In any action on a contract, where the contract specifically provides that attorney’s fees and costs, which are incurred to enforce that contract, shall be awarded either to one of the parties or to the prevailing party, then the party who is determined to be the party prevailing on the contract, whether he or she is the party specified in the contract or not, shall be entitled to reasonable attorney’s fees in addition to other costs. When a contract contains a provision granting either party the right to recover attorney fees in the event of litigation on the contract, Civil Code section 1717 (hereafter section 1717) gives the “party prevailing on the contract” a right to recover attorney fees, whether or not that party is the party specified in the contract. It defines the phrase “party prevailing on the contract” as “the party who recovered a greater relief in the action on the contract,” and it provides that a trial court” may also determine that there is no party prevailing on the contract for purposes of this section. For a landlord that analysis starts and stops with the rental agreement when a court determines if the landlord who prevails in an Unlawful Detainer case can recover legal costs enforcing the contract. First, the court will look to the rental contract to determine if the attorney fee provision is a two way street giving either the landlord or the tenant the right to collect legal expenses if they are the prevailing party in an Unlawful Detainer case. If the provision is not reciprocal meaning it can be awarded to either party, then the court will not enforce it. 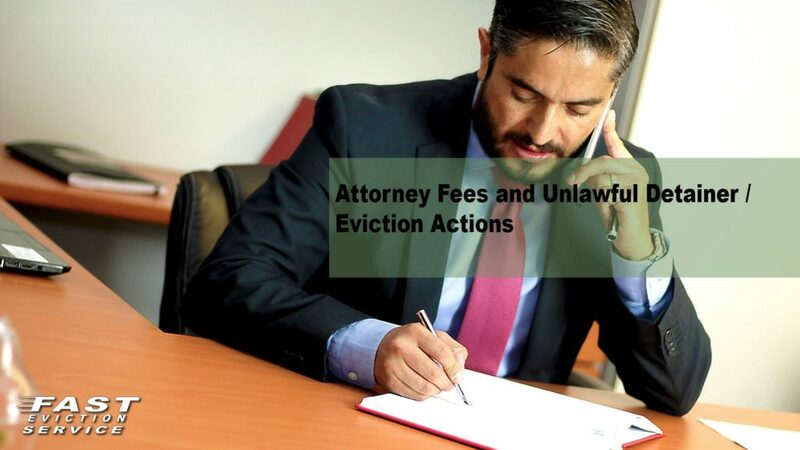 That brings us to the question as to what happens in a situation where the rental agreement does not limit the amount of legal costs in an action based on the rental agreement such as an eviction case. An unlimited attorney fee provision in a rental agreement exposes both parties to an award of reasonable legal costs that is left to the court to decide. Many tenant defense attorneys love unlimited attorney fee provisions because they can push the case to a jury trial believing that the landlord has deep pockets to pay for an attorney fee award while realizing that the tenant(s) will probably not have the funds to pay for any attorney fee awarded to the landlord. For defendants, it is a win-win situation for the likes of BASTA, Eviction Defense Network and the other Eviction Defense Attorneys. That is why it is always recommended that that the rental agreement limits the amount of legal expenses to a fairly low amount like $500 to $1,000. If your current rental agreement contains an attorney fee provision that is unlimited it is suggested that the provision be modified by serving a 30 to 60 Day Notice of Change of Terms of Tenancy limiting the legal costs provision to $500.00 to $1,000.00. However, that is not the last word in attorney fees in Unlawful Detainer litigation. As stated above, legal costs in an Unlawful Detainer action can be awarded pursuant to the terms of the rental agreement or by statute – such as Civil Code Section 1942 commonly referred to the breach of the warranty of habitability. If a tenant files an answer that raises the breach of warranty of habitability defense and prevails on that defense the court can award attorney fees to the tenant pursuant to the statute. This can be very troublesome in the City of Los Angeles where the judges are very tenant friendly and routinely issue a conditional judgment in favor of the tenant because the rental property was uninhabitable. All landlords should take preventative measures, such as serving a 24 Hour Notice of Entry to the rental unit at least every six months, to inspect the rental unit for needed repairs and should also have a history showing timely responses to any work orders, to prevent claims such as the breach of the warranty of habitability.